Tiemoue Bakayoko’s deflected shot fell to Paqueta but his shot was weak in threatening Thomas Strakosha. Patric, Immobile and Sergej Milinkovic-Savic all saw tame efforts from inside the box glance past Gianluigi Donnarumma’s right-hand post. The hosts had a penalty shout turned down just after the hour mark. Immobile was pushed to the ground by Alessio Romagnoli as he cushioned the ball with a header, but he was judged to be offside by the assistant referee. The best chance of the final 45 fell to Immobile with 10 minutes to play. 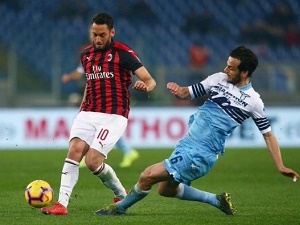 He found himself in space one-on-one against youngster Donnarumma, but his audacious attempted chip hit the post and rolled out for a goal kick.